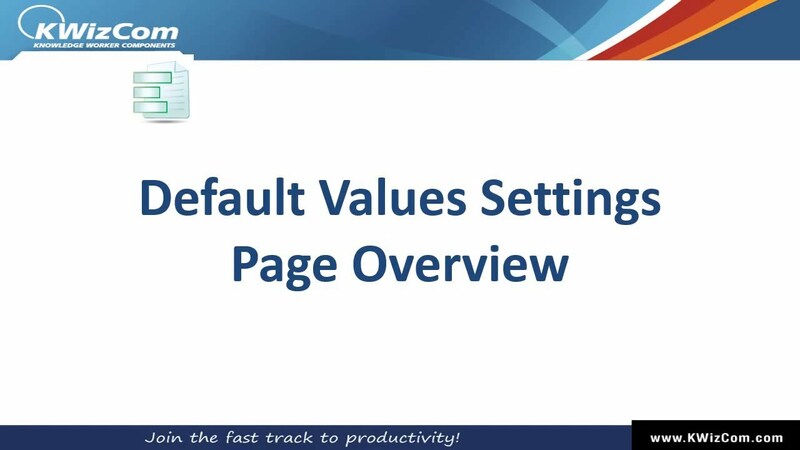 Bridging over this SharePoint gap, the KWizCom Default Values web part allows you to easily configure default values for all column types, and by enabling you to target different default values to different audiences. Add Dynamic default values to your SharePoint list forms! There are column types for which SharePoint doesn’t allow you to configure default values. Examples for such column types are Multiple lines of text, Person and Lookup columns. Is there a single SharePoint user who didn’t face the unpleasant experience when uploading a document and then having to manually copy its name to the Title field? With the Form Default Values feature you can easily configure default values based on values of other columns, and also use dynamic tokens such as [Me] and [Today]. Sometimes depending on your forms logic you need different users, filling out the same form, to have different default values in some of the form fields. For example, when an end-user fills out a new Support Ticket form, the “Reported By” field should have by default the value of the current user. However, when a Helpdesk engineer fills out the same form he probably does it on behalf of some end-user, so he would require this field to be empty by default. The Form Default Values Feature is part of KWizCom Forms, which allows SharePoint customers to keep using the out-of-the-box list forms by turning them into powerful & dynamic web forms. This way there’s no new technology to learn and deploy, simply keep using the same SharePoint list forms that now can include all the missing web form features. Download and install KWizCom Forms Profesional Edition, according to the KWizCom Forms installation instructions provided in the admin guide. Once you installed KWizCom Forms, all its features (Including Form Default Values) will be available for 1-month evaluation. To activate the Form Default Values Feature, as well as to learn about its configuration options please follow the guidelines provided in the KWizCom Forms admin guide.